The company’s innovative BrainScope One system is an easy-to-use, non-invasive, hand-held platform that empowers physicians to make more accurate TBI assessments quickly and at the point-of-care. BrainScope’s unique system leverages advanced digital signal processing, sophisticated algorithms and machine learning technologies to identify and evaluate key brain electrical activity biomarkers of TBI. BrainScope One also includes digitized versions of standard clinical assessments for milder forms of TBI known as concussion. The BrainScope One brain injury assessment device uses revolutionary EEG-based technology that facilitates confident decision-making on the spot. 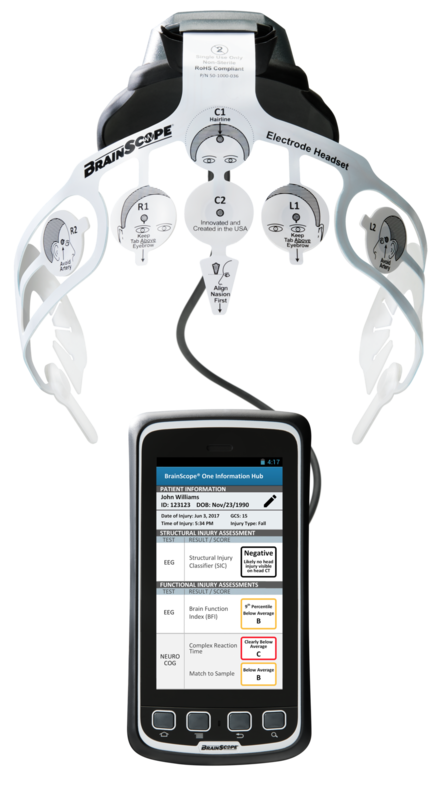 BrainScope One is not intended as a stand-alone diagnostic or to be used as a replacement for a CT scan. Click here for complete indications and 510(k) Summary for the BrainScope One.